Georgia's Playroom Mama Say What?! | Mama Say What?! I think that many mamas (and dads) and little ones dream of having a playroom. 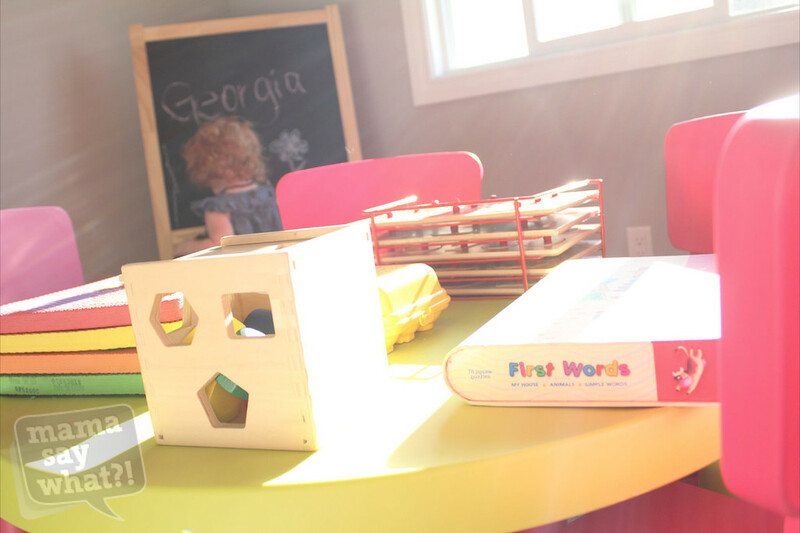 Mamas want the playroom for the ability to put toys away and children want a toy room because, well, it’s a room full of toys! When Mama Say What?! mama Sarah and her husband moved into their new home, they decided to use their unoccupied room as a play room for their beautiful little girl, Georgia. While keeping the décor to a minimum, I think that Sarah did a fantastic job with this space. I’m sure Georgia would agree! We had just finished building a house and were in the process of moving in when we thought, why not use the second bedroom as a playroom until baby #2 arrives? Either that or it will sit empty, and to be honest, I didn’t really want my main floor flooded with toys! Georgia’s playroom doesn’t really have a theme; it is really just a collection of her toys that we rotate. We knew we wanted it to be bright and colorful, as well as stimulating and educational. What did you use for inspiration? Did you do it in your head as you went along? Or did you have an organized system with inspiration boards? The room we are using is only about 12 x 12, so it’s not a “large” room by any stretch. Because of this, my online searches for inspiration were very limited. As I normally do, I decided just to do it all in my head! I wasn’t putting much décor into it since I would eventually be changing it to a second baby’s room and I didn’t want to have to repaint or take a ton of pictures down. I knew what I wanted in my head, I just needed to execute it. I wasn’t planning on making it anything overly elaborate, which it is not, but I did want it to be a room that Georgia very much enjoys! I did not paint the room since I didn’t want to paint it again when I was pregnant with our second child. So the walls are a nice subtle grey-beige. All of her toys and stuffies, however, are very bright— I wanted it to be exciting! 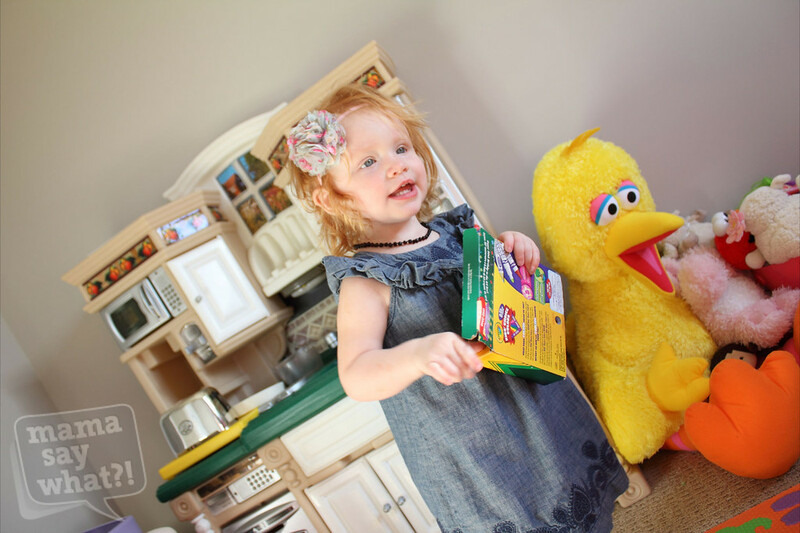 She has an amazing table from Ikea that is green and she has pink chairs to match, a huge big bird, a kitchen set, chalk board and a closet full of toys to rotate. I guess you could say there isn’t really a color scheme, it’s more just bright with many elements put together. What are some of the storage solutions you utilize? I’m not going to lie; we don’t have much for storage in this room. 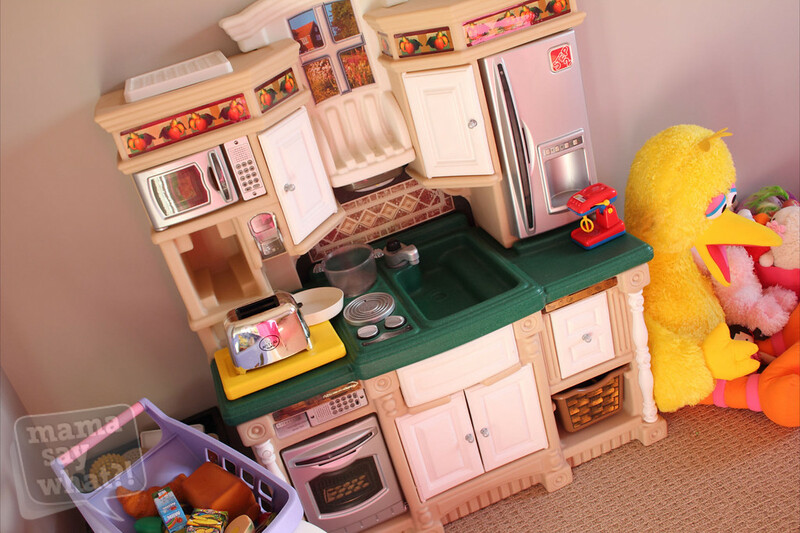 Her table serves as a “shelf” for a couple of her games, her shopping cart and kitchen house a bunch of play food, and other than that, most things are in little buckets or backset along the edges of the room. We also have toys in her closet in totes for when we rotate. It’s not the most efficient, but it works for us! I didn’t spend a dime on this room! Since I didn’t paint or buy any bins or pictures, I was able to save myself money. 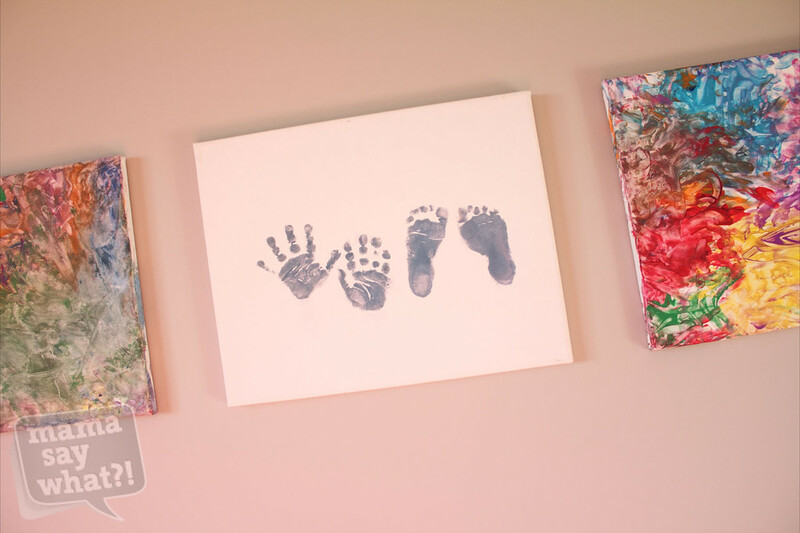 We already had the baskets we are using in the room and the pictures that are hung are finger paintings she did when she was six months old. Had I gone “all out,” I would have been on a budget and would have done my best to stay under $200. 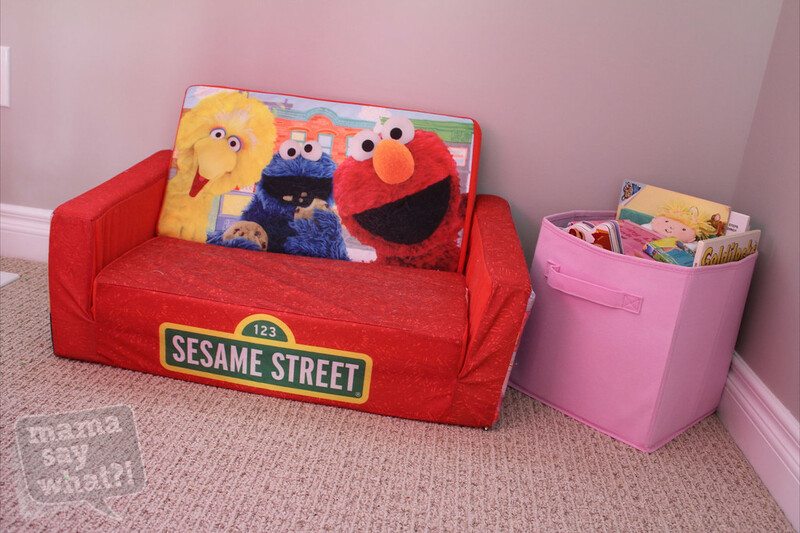 It’s a playroom; it can be turned into that with a few toys and some pictures! My favorite part is her table. We have spent many hours there sitting and reading books or playing with her puzzles. It will grow with her for many years to come! What is Gia’s favorite part of the playroom? 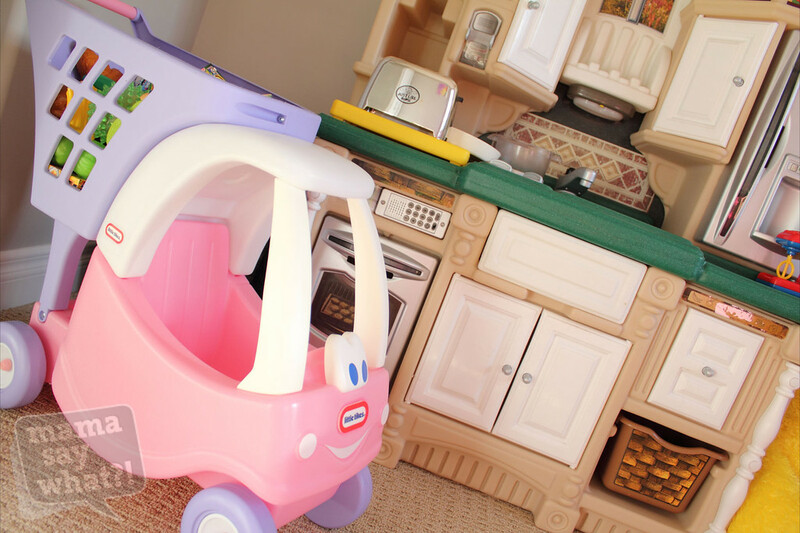 Gia’s favorite part is her play kitchen. She plays with that kitchen constantly, even when she should be in bed sleeping I hear her pushing the little microwave buttons. She likes to push her shopping cart up and down the hallway, then come back and put the groceries away. Cracks me up every time! Go simple. 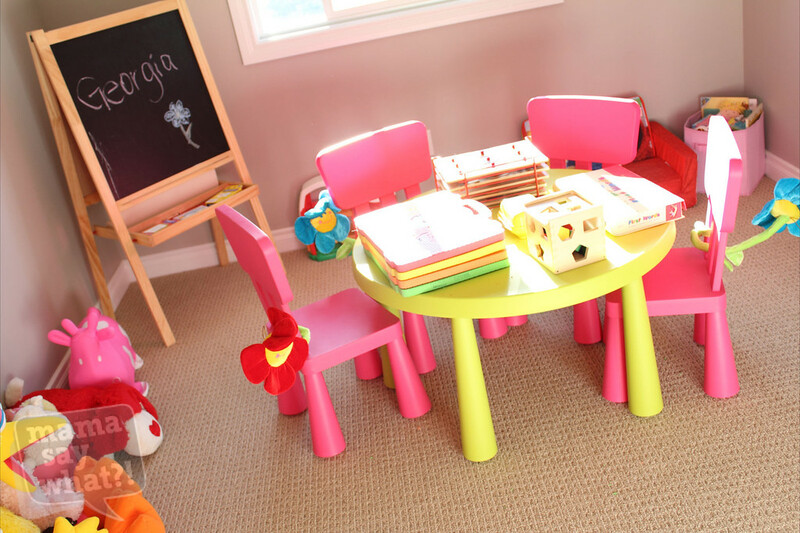 It is very easy to get carried away with any room, especially a fun playroom for your child! 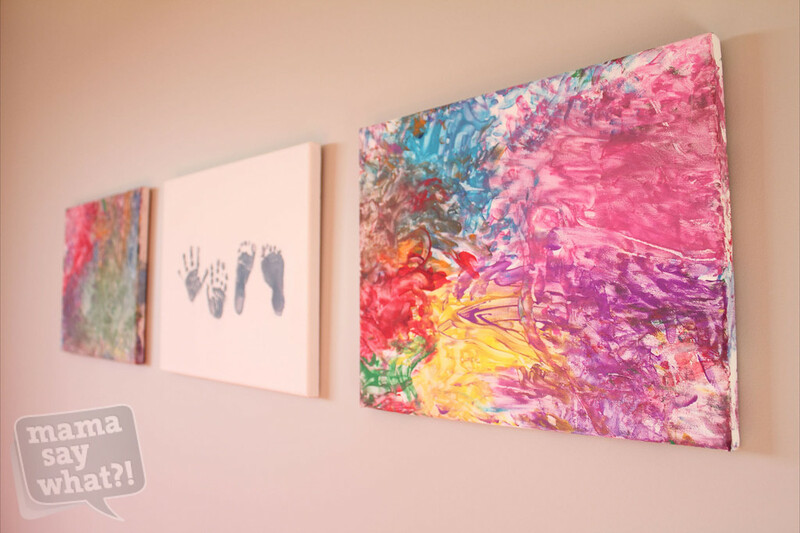 Painting will light up the room even more, but if you don’t have the time or money to do it, just put toys in the room in an organized way and it’s a playroom. 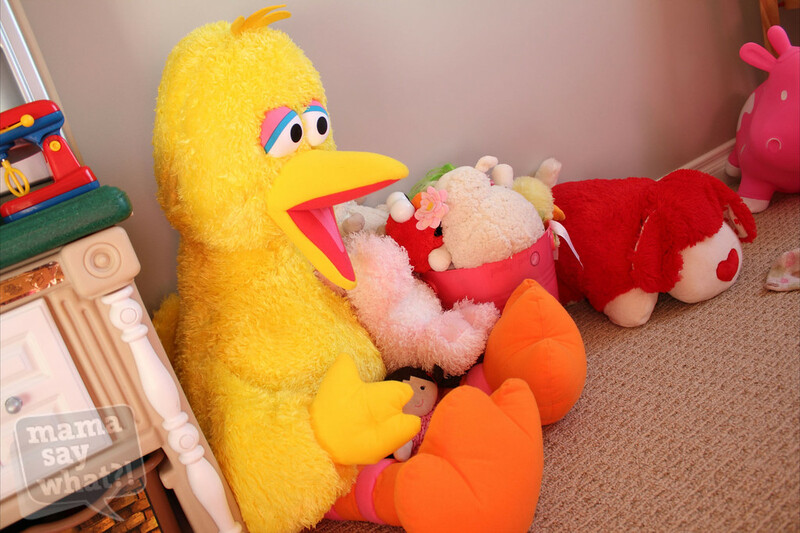 All you really need is some toys, a couple storage solutions, a child to play in it and some love! Easy as that! I love that table, where did you get it from ? Georgia’s Grandpa bought that table for her for her first birthday! It’s from Ikea and she loves it!